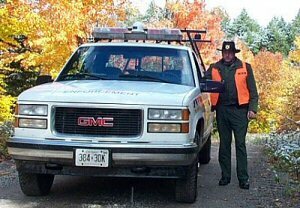 Dan Slater, a Conservation Officer in Algonquin Park, has been chosen as the MNR/OCOA Conservation Officer of the Year based upon over 15 years of outstanding service. A selection committee consisting of field and main office staff, and representatives from the provincial enforcement training program and the Ontario Conservation Officers Association (OCOA) selected this year’s winner of this very prestigious award. · An officer whose character is beyond reproach; · An officer who is competent, knowledgeable, and capable; · An officer who promotes wildlife law enforcement; · An officer who demonstrates professionalism in every facet of life; · An officer who is actively involved in his/her community. 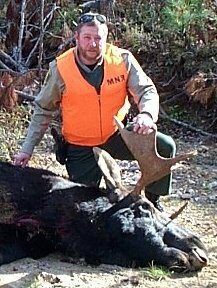 Dan has been a full time Conservation Officer in Ontario since 1987. Prior to his appointment as a C.O., Dan did contract work as a Park Warden in Sudbury District and also worked as a Wildlife Technician and a Fisheries Technician in Napanee District for several years. Dan has achieved a career of day-to-day quality work, ethics and values that established relationships with people by putting respect, truthfulness and honesty above all else. Dan is a very competent officer who is comfortable with his knowledge of the law and his application of its principles. He has good knowledge of Algonquin Park’s interior and does not hesitate to assist the public in finding their way around this vast wilderness. Dan’s knowledge of the Park is exceeded only by his knowledge of computers and he is quick to share new information with other field staff. Dan served on a committee, beginning in 1992, which was instrumental in developing an automated system of recording fish and wildlife violations (CAVRS). Dan was also involved in setting up the CO LOG and EN4CNET programs – automated databases of Conservation Officer information and call log-in program for use at the Provincial Communications Centre. Currently Dan is working on the development of a province-wide occurrence and complaint reporting and analysis program. Dan has also developed the Ontario Conservation Officers Association web site. Dan is a very caring and compassionate individual and is not one to stand by and watch from the sidelines when something happens. This was true when Dan’s friend and colleague, Dee Dunsford broke through the ice in the winter of 2000 on Clark Lake in Algonquin Park. Dee was on board a trail groomer that broke through the ice and plunged to the bottom of the lake. Dan was one of the first people on the scene and entered the icy water in an attempt to save Dee. The young woman lost her life; another passenger, Glen Yanke survived the ordeal. To no one’s surprise, Dan was on Parliament Hill for the Fallen Officers Memorial in September of 2001 when Dee’s name was added to the scroll. Dan was also involved in a life saving incident in the fall of 2000 when he pulled a woman from a burning vehicle at an accident scene. Dan administered First Aid and stayed with the injured woman until the ambulance attendants took over. Dan’s wife Elaine is involved with the Girl Guides and she informs us that Dan is often called upon to make presentations on fish and wildlife related issues. Dan’s daughter, Allison, is a figure skater and Dan contributes to the club by supporting fund raising activities. 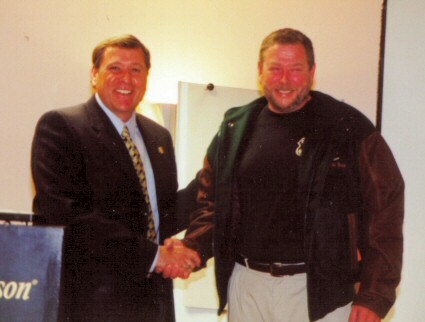 In addition to receiving the Ontario Conservation Officer of the Year Award, and being selected as the OCOA Officer of the year, Conservation Officer Slater received the Shikar-Safari International Wildlife Officer of the Year award, as well as the Midwest Association of Fish and Wildlife Agencies (part of the International Association of Fish and Wildlife Agencies) Officer of the Year award. Officer Slater was presented with the Ontario Officer of the Year award at the OCOA meeting in Aurora this August. These presentations and awards reinforce the high quality of staff that both the MNR and OCOA are proud to have working for the OMNR enforcement program.